If you need to process a Manual Entry transaction to charge a customer’s credit card (whether the card is present but not able to be swiped or the card is not present for a phone order), you may key in the card information once you have entered the necessary information (room number, amounts, etc) for the Check-In, Check-Out, Quick Stay or Sale transaction type. 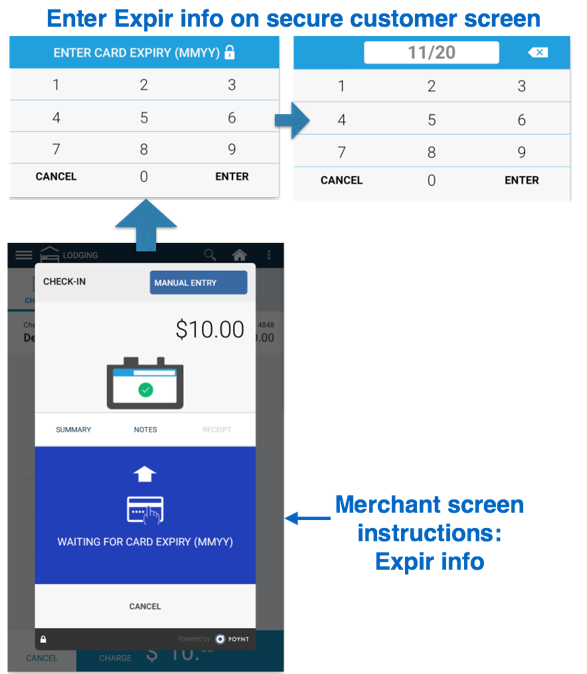 When you are at the pop-up screen that prompts for “Tap/Insert Card”, you may choose the Manual Entry method. Note: Manual Entry transactions will prompt the clerk to enter/tap in the credit card information on the smaller secure customer screen and then continue processing on the merchant screen once card information is entered. Processing a Manual Entry transaction will prompt the clerk to review any displayed AVS Response Code information (if returned by the card issuer) and then determine whether to Proceed or Void the transaction. 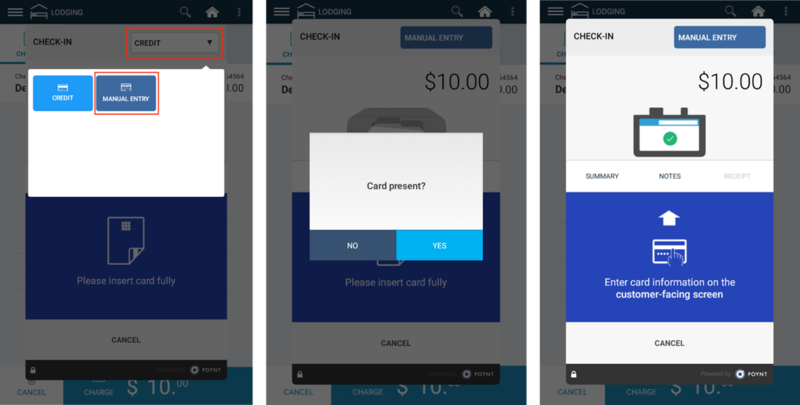 Step 1: On the “Please insert card fully” screen, tap on the upper right-hand drop-down menu and tap on Manual Entry. Step 2: You will be prompted to indicate whether the customer’s credit card is present or not. Step 3: Enter in required cardholder credit card number and expiration month and year. Note: That part of the card number will be masked for security reasons. Step 4: Enter in required V Code (or Security Code) information – also known as CVV/CVV2/CVC/CVC2/CSC and is the secure code typically on the back of a credit card. 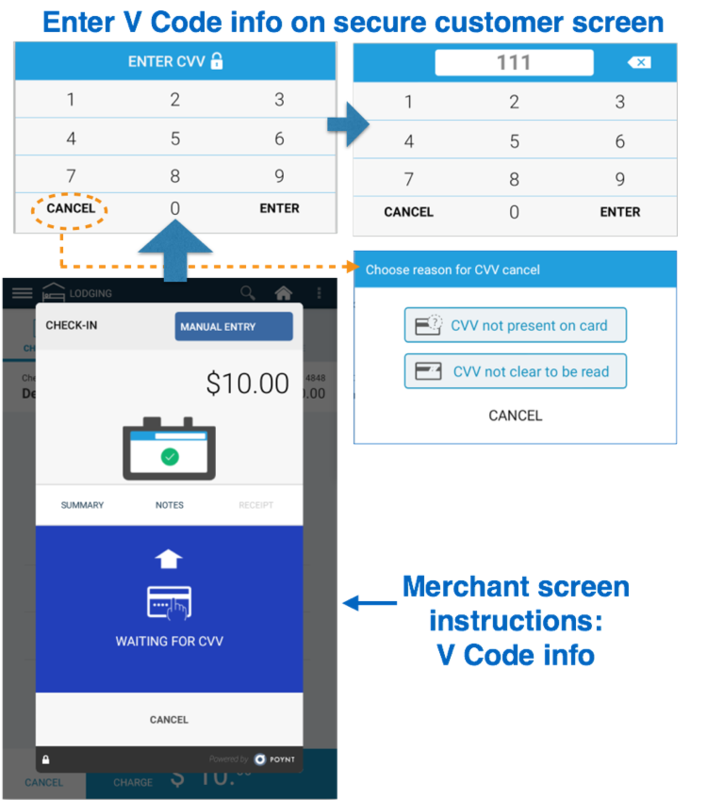 Note: If the V Code is not present on the card or if the V Code is illegible, the merchant can tap on the Cancel button on the CVV entry screen and proceed to the next step. Step 5: For Card Present transactions, enter in Zip Code information. For Card Not Present transactions, enter in Zip Code information and then enter in Street Number information. Step 6: Manual Entry transactions are processed for V Code and AVS Code matching. A manually entered transaction may be approved by the cardholder’s issuing bank even if the address verification information or card verification does not match. AVS Code and V Code processing provide the merchant additional information to help make informed decisions prior to shipping products to their customer. The merchant to can determine to Void or Proceed with the manually entered transaction based on the V Code and AVS Code responses. 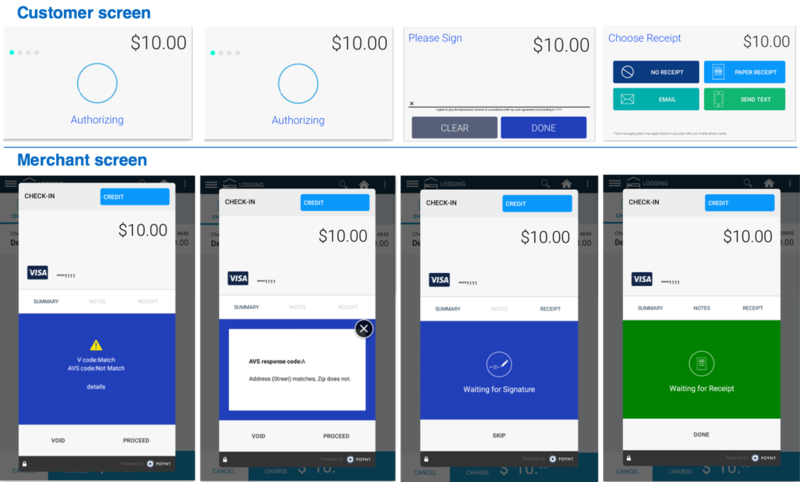 If both the V Code and AVS Code Match and the transaction is authorized, then the transaction proceeds directly to Receipt option screen. If either the V Code or the AVS Code does not match and the transaction is authorized, then the merchant screen will display information on whether the V Code or AVS did not match. Tap on ‘Details’ to view the additional AVS Response Code information. 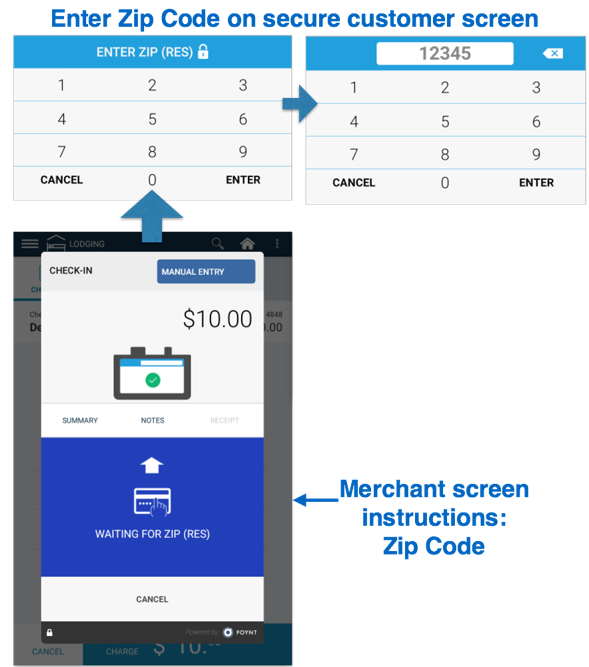 The merchant can choose to ‘Void’ the transaction or ‘Proceed’ with the transaction and go to the Receipt option screen. Note: For Manual Entry transactions, the printed receipt will show the V Code and AVS Code information.